The easiest way for us to test if our water was feasible was measuring the water's pH. pH is basically power of hydrogen. The mathematical equation of pH is the negative logarithmic value of hydroxonium ion concentration. pH values are calculated in powers of 10. The hydrogen ion concentration of a solution with pH 1.0 is 10 times larger than the hydrogen concentration in a solution with pH 2.0. We discovered that Tap water had a pH of 7 and landscaping could tolerate a pH of 7-8.3 or water-baking soda. However, the water from your shower has a pH of about 9-10 because of the soap, shampoo, etc. 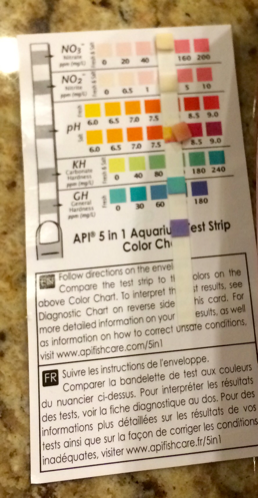 Using pH 5 in 1 apifish care test strips, we tested to see if our filter would be feasible.